An FTA with the world’s largest market will help Cambodia diversify its export market, currently dominated by the European Union and the United States. Prime Minister Hun Sen raised the issue of an FTA with China during a meeting on Monday with Chinese president Xi Jinping as part of the Cambodian premier’s official visit to Beijing. In the meeting, Mr Hun Sen said that, with economic ties between the countries stronger every year, an FTA seems like the next logical step. During the meeting, Mr Xi stressed that both countries have benefitted from close ties in recent years. “China will continue to increase cooperation with Cambodia to aid the development of the country. Our countries will continue to work together in all areas, including politics, security, economy, and society,” Mr Xi said. Trade between Cambodia and China reached $5.6 billion last year, a 12 percent increase from 2017’s $5 billion. However, China’s share of the Kingdom’s export market is still small compared to those of the EU and the US, who jointly account for more than 70 percent of Cambodian exports. 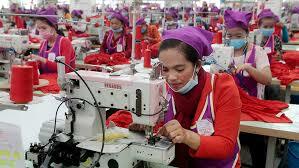 Kaing Monika, deputy secretary general of the Garment Manufacturers Association in Cambodia (GMAC), said Prime Minister Hun Sen’s initiative to push for an FTA with China is a step in the right direction. “An FTA, if well negotiated, would benefit both countries,” he said. “Modern FTAs do not just focus on tariff reduction, bringing about cheaper products for consumers, but also tackle the promotion and protection of investments. “As China gets richer, it represents a very big and lucrative market. The ability to enter China would help Cambodia in terms of market diversification. “But, first, the Kingdom must overcome a number of challenges, including high prices, low quality, costly logistics, and other compliance issues. This is never an easy task,” he added. David Van, executive director of Deewee Management Consultants, said the more bilateral trade agreements Cambodia enters, the better. “Cambodia should have sought to enter FTAs with many markets on a bilateral basis just like our immediate neighbours, but we never did so over the last two decades. “We only dealt through Asean, piggy riding on FTAs between Asean and other countries, which takes an extremely long time considering that there are many parties involved,” he said. Mr Van questioned whether China would be interested in entering such an agreement with a small economy like Cambodia. “Would China be willing to trigger an FTA negotiation with Cambodia considering the small size of our own market? “I have no answer to this question. I can only say that the more bilateral agreements Cambodia has, the less exposed we will be to certain external risks,” said Mr Van. “FTA is a complicated negotiation and Cambodia also needs to meet stringent sanitary and phytosanitary requirements and other criteria set by the other party, so, do we have the institutional capacity to do this?” he asks. Long Kemvichet, spokesman for the Ministry of Commerce, said FTAs are considered the next step in strengthening trade with partners. “This is different from unilateral arrangements provided through various preferential systems where the decision to withdraw is not based on legal instruments,” he said. As a member of Asean, Cambodia benefits from FTAs signed between the regional organisation and other countries and regions, including Australia and New Zealand, and Hong Kong, he explained. From 1994 to 2016, China invested $14.7 billion in the Kingdom, mostly on four sectors – agriculture and agro-industry, manufacturing, infrastructure, and services and tourism, according to the Council for the Development of Cambodia (CDC). China also funded the Sihanoukville Special Economic Zone, which cost $3 billion and now hosts 108 enterprises and companies. In the tourism sector, China recently invested in two big projects, an international resort in Koh Kong province and a five-star hotel and resort in Preah Sihanouk. Moreover, of the 23 companies investing in the mining industry, 10 are from China. China is the largest foreign investor in the energy sector in Cambodia, with more than $7.5 billion invested in hydropower plants and about $4 billion in coal-fired power plants. During the meeting, Mr Xi said China will provide 4 billion yuan ($587.5 million) in assistance to Cambodia through grants in the next three years. Meanwhile, Prime Minister Hun Sen confirmed his attendance to the second executive summit of the Belt and Road Initiative (BRI) to be held in April.